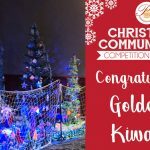 KANDU Industries Inc.Christmas CommuniTree Winners - KANDU Industries Inc. The winners of Pontiac Convention Center’s Christmas CommuniTree Competition & Show have been chosen! Local businesses, organizations and groups set up and decorated trees to promote their mission and creativity to the public. The trees were available for public viewing December 3rd through the 21st and visitors were asked to vote for their favorites. Congratulations to Golden K Kiwanis for winning all three categories, including “Most Innovative”, “Best Theme” and “People’s Choice”, earning them the $300 cash prize! Thank you to all who participated in this fun event!